In consideration of optimizing your purchase and investment into the most practical and effective dental foods for cats and dogs, there are some points to consider. Firstly, it’s essential that you seek out foods in general – for cats or dogs- that are rich in nutrients, and those with antioxidants to improve overall health are most strongly recommended. Trusted cat and dog foods that specialize in dental protection and preventative ingredients typically have fiber technology in their foods that scrub teeth and reduce plaque buildup in your cats or dog. 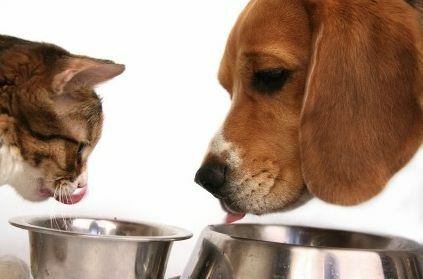 The minerals found in these cat and dog foods usually contain essential amino acids, no artificial flavoring or coloring, and have little to no preservatives or byproducts (meals). The most effective, specialized dental foods for cats and dogs will reduce (bad) oral bacteria build-up which directly impacts plaque build-up and overall oral hygiene in your pet. When possible, try to select a dental cat or dog food that has been given a Veterinary Oral Health Council (VOHC) seal of approval to get the most bang for your buck, and improve your pets oral hygiene and habits. Reducing tartar development can be a very difficult task, especially when a pet is relying on unhealthy foods or ones otherwise riddled with unhealthy calories, GMO’s, and lard. High calorie meals can cause your feline-friend or dog to throw up it’s food. When selecting a dental dog or cat food product, avoid hairball causing compounds such as Petromalt, Femalt, and Laxatone. Some of the most premium, popularly selected dental cat foods are Purina Veterinary Diet Feline Dental Health, Feline Greenies (also available for dogs) and other Purina products. Purina DH and greenies are also the most popular, best-rated products as dental-protection based food products for K-9’s. If possible, select a dental dog food that specifically has Sodium tripolyphosphate, as it helps to prevent dental tartar buildup in your dog’s mouth. Another really popular, organic and healthy choice for improving dental hygiene and preventing problems with dogs is the Royal Canin, Canine product-line. The Royal Canin products also add Glucosamine and chondritin to their foods, improving your pets overall joint health as well. Omega-3 fatty acids are an absolutely top-rated characteristic, so if you can find a dental dog food that specifically has this then all the better – as it aids in removing and preventing plaque in your K-9 friend’s mouth.